In early 2002 a limited run series of chilling Science Fiction tales aired on BBC Radio 4. The series was entitled Chillers (or Chillers – Four Tales of Terror). The scripts were by Gold Sony award winning dramatist Mike Walker, the original stories were by top SF authors. Before today I’d recommended to everyone who’d listen, the first of these, Who Goes There?. It is the finest half-hour of Science Fiction Audio Drama I’ve ever experienced. But now the entire four episode series is available in the Zombie Astronaut‘s latest issue. I’m going to be savoring the rest thanks to ZA! Penned under the name Don A. Stuart, the novelette that this play was based on was first published in the August 1938 issue of Astounding Stories. An alien being is found frozen in the ice of Antarctica. When it is thawed, it awakens, to become a threat to the small base camp. In fact, it’s a threat to all life on earth, as it can change shape and absorb the life and bodies of every living thing it comes in contact with. The Hugo Award winning short story this play was based on first appeared in the March 1968 issue of Worlds Of If. This is a tale of five people kept alive by AM, a computer that came alive, waged war and won against mankind. It’s hatred of mankind is so profound, that it kept these five alive only to torture them. First appeared in a 1987 anthology entitled In the Field of Fire, which was a collection of SF and Fantasy stories dealing with Vietnam. Taking place in the Vietnam War era, this is the story of a Southern country boy who exorcises his demons making late night broadcasts to phantom military units. Then, one answers. First published in Fantasy And Science Fiction Magazine‘s October, 1967 issue. This is the story of an injured man and a girl who seeks death to free her from the pain that comes from her telepathic ability. Their common bond is a pop musician who offers peace to both. Tony and Ciaran’s Starship Sofa podcast is chugging along, talking about Science Fiction in literate hour (or so) long chats. Below we’ve linked to the latest author and author/editor shows but you’ll also find email shows, shows on TV programmes and movies, a couple Christmas specials and even a theme show on religion in Science Fiction in their podcast feed. And if you surf over tho their website you’ll find the links to their older episodes too! What do you do if you have a good voice and want to record something Speculative Fiction related but don’t have any ideas on what to record? 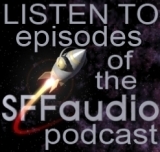 At SFFaudio our first and best love is UNABRIDGED Science Fiction audiobooks. The good news is there are a large number of public domain Science Fiction or Fantasy novels that have yet to be read aloud. You needn’t bother with fancy sound effects. There’s no need for incidental music. In fact most audiobook listeners prefer their listening to be without these frills. All you’ll need is a microphone and a nice quiet room. This is the way traditional audiobooks have been recorded for nearly thirty years. But even with all those years of recording there are still DOZENS and DOZENS of name-author novels and stories available for your narration. These will be exclusive recordings! With all the hype about Creative Commons of late you may have forgotten or maybe you never realized that there is so much in the public domain still to be recorded. In researching the complete fiction audiography of Cory Doctorow I came across no fewer than three versions of Cory’s Down And Out In the Magic Kingdom audiobook. That is probably two times to many – especially when you consider that so many public domain titles are still languishing unrecorded! This title has been COMMERCIALLY RELEASED by Books In Motion. Warlord Of Kor by Terry Gene Carr |Manybooks.net| *There is now a multiple-reader version available from LibriVox, but someone wanting to do a single voice reading is still invited to do so). If you have any questions about the contest, or anything written above let me know and I’ll add details. SFFaudio wants you to make audiobooks! 1. Choose a title from the list above. You’ll probably want to print out at least one copy of it. Read through the novel, make sure it is something you’ll want to record. 2. Get yourself a microphone. I hear USB mics work quite well but many amateur narrators get good use out of cheaper equipment. 3. Audacity is some good freeware that many people starting out using. It is relatively versatile and the learning curve isn’t too high. You’ll probably also want to grab an MP3 LAME encoder so you can export your files into the MP3 format. HERE is a link on how to do that. 4. MP3 format is the preferred standard, but it isn’t required to fulfill the contest. Details on what bit-rate, etc, should be worked out in advance, LibriVox and Podiobooks.com both have resources that can help you choose (more on that below). 5. There is a terrific resource available at Podiobooks.com. Their authoring guidelines (a PDF file) will give you a good general outline of what standards and practices will help you to make a better audiobook. Also, LibriVox has a number of experienced amateur narrators in their forums from which you can draw expertise. They have also created a wiki that will answer many technical questions. Thanks for pointing that out Banshee. Yikes! If someone has already started recording a copyrighted version of one of these novels listed at Manybooks.net they will still be eligible for the prize (but they will still have to prove they recorded the entire novel), they will obviously however not be able to release the audiobook in any sort of commercial capacity. If this turns out to be the case the entrant who recorded a public domain version will still get a prize. I will award two prizes (of your choice) – one to the ‘mistaken copyrighted’ entrant, one to the public domain entrant. Nobody will be cheated for an error of ‘was it copyrighted or public domain?’ Sound fair? Three titles have been claimed! One has already been completed, another is set to release and one is set to begin recording. Nice work folks! Four titles have been claimed. One has completed, another is set to release and two others are going to begin recording soon. Cool! Seven titles have been claimed. One has been completed and released, another has been completed and is being podcast! More updates as they come. Eight titles have been claimed. Three have been completed and released! All three of the prize audiobooks have been won. I’m still not sure what prizes will be offered to those challengers who are still striving to complete their claimed titles. Suggestions are welcomed. Only 9 titles remain unclaimed! I’ve pulled Triplanetary by E.E. “Doc” Smith from the list because it has actually been commercially released already. The Answer by H. Beam Piper will be appearing in an H. Beam Piper short story collection. Only 7 titles remain unclaimed! This is so awesome. A mere 6 titles remain unclaimed! Nice work folks! 7 titles have been completed, and only 4 titles are left to be claimed. Zombie Astronaut, one of our favorite mp3 webzines, has sadly shuffled off it’s undead coil. The aural delights have ceased due to ZA’s overwhelming popularity. It seems that the bandwidth traffic made for a giant expense in the anonymous host’s pocketbook. It is a bitter shame that mere $$ have downed this floating corpse when even death itself didn’t stop it. Alas. An interesting podcast in a similarly horrifc vein is available, it’ll help relieve some of the loss of ZA’s passing…. Tales Of Horror Episode 11 – From the BBC Radio series Chillers an AWESOME adaptation of John W. Campbell‘s classic “Who Goes There?” If you download no other, download this one! Tales of Horror Episode 4 – From the CBC Radio series Nightfall “The Club of Dead Men” A Canadian student at Cambridge, spends the night in a room once used for meetings by members of the Everlasting Club. Spooky. Tales of Horror Episode 2 – From the CBC Radio series Nightfall “The Monkey’s Paw” by W.W. Jacobs an accursed curio from India destroys lives with its promises of three wishes. Much adapted, but likely never better that this.